Receiving the Ten Outstanding Young Americans award in 1993 with the other recipients. 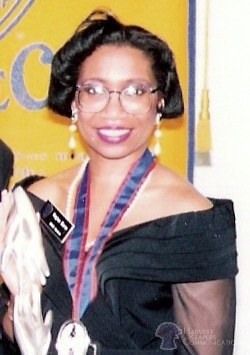 In 1993, Regina L. Burns was honored with the prestigious Ten Outstanding Young Americans award, given by the U.S. Junior Chamber (Jaycees). Harvest Reapers Communications is a Dallas, Texas-based boutique agency specializing in public relations services. Regina L. Burns founded Harvest Reapers Communications in Memphis, Tenn., in 1996. Prior to starting the agency, she successfully marketed the Imperial Tombs of China exhibition to the African-American community, while working for Sossaman & Associates Advertising Agency. At the urging of Ken Sossaman, Burns joined a media trip to Hong Kong, Beijing and Xi'an, China, in advance of the exhibition, to ensure she was well-versed in the artifacts’ history and the Chinese culture. After returning to Memphis, Burns researched and wrote a 30-minute presentation "From Food Stamps, Welfare and Free Cheese to The Great Wall of China" and presented it to groups and organizations. Her strategic and inspirational story helped generate a 50 percent increase in group-ticket sales for Imperial Tombs of China. Furthermore, at least 40 percent more African American volunteers and docents signed up to participate. We specialize in strategic communications that goes beyond achieving results. We care about impact. Our clients relish working with a senior-level, strategic communicator well-grounded in award-winning 24/7 multiplatform journalism. Our proven leadership, teamwork and public affairs advocacy achieve impact. What is impact? Improving lives, enhancing behaviors, educating minds and elevating quality of life. We work with organizations deeply committed to standing out above the crowd on issues such as poverty, youth achievement, the arts, domestic violence, disaster recovery and public education. Please let us know what public affairs problems your organization needs help solving. Please get in touch. ©1997-2019, Harvest Reapers Communications. All Rights Reserved. For more information, please email or call 214.432.0643.